I’m participating in the sherman mills winter festival. I’ll have my studio open and will be selling drawings at studio prices. I’ll also have cards, note pads, calendars, and other little gifts for sale. Featuring the works of over 20 of our own artists. 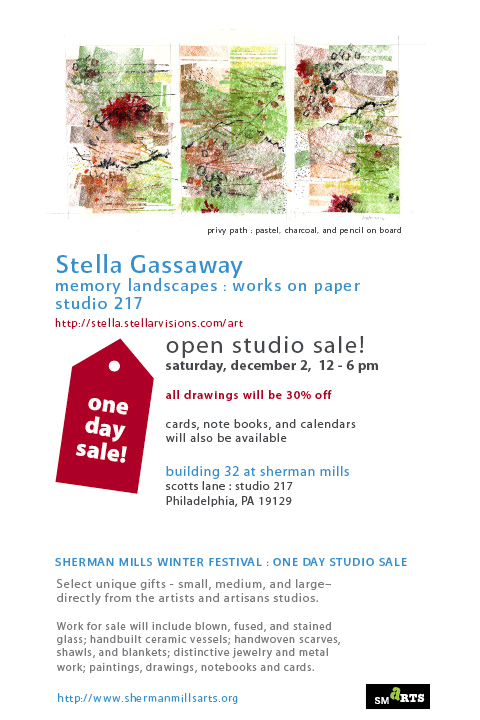 Sherman Mills Arts Council [smARTS] invites you to spend the day at Sherman Mills for our Winter Festival, the first Saturday of December. Bring your friends and family. Select unique gifts – small, medium, and large – directly from the artists and artisans studios. Work for sale will include blown, fused, and stained glass; handbuilt ceramic vessels; handwoven scarves, shawls, and blankets; distinctive jewelry and metal work; paintings, drawings, notebooks and cards. Both Crafts for Living and Schuylkill Gallery will be open to visitors. Bring the whole family and enjoy hot chocolate and cider. Join in arts and crafts for the kids from 2 – 4pm. Chat with the artists and artisans that are your neighbors. Watch glassblowing demonstrations. Enjoy the season. While you have giving on your mind give to those less fortunate than you. smARTS is pleased to support the more than 1000 children and their families that Northern Home for Children serves. These families are in critical need of warm hats, mittens, scaves and coats in all sizes. Bring any of these items to the festival and drop them off at the Northern Home table. Please only items that are new or in good condition, something you or a member of your family has outgrown. If you don’t have clothing you can make a contribution at the Northern Home for Children table. Sherman Mills Arts Council is dedicated to creating a self-sustaining community of artists and artisans that are supported in an environment that allows for the creation, exhibition, and sale of their artwork — building Sherman Mills’ reputation as a unique arts destination. Sherman Mills is a vibrant and diverse community of artists, residents, and businesses. The arts community continues to grow with new art studios being constructed. The community features two galleries: Crafts for Living and Schuylkill Gallery. I was hanging out having a cuppa last week and along comes Lucy. She’s my pal. I have known her since she was so small she could fit in my hand. Now she is a full grown graying old lady. She likes to sit on my feet. She used to be paralyzed at the hind end and now she can walk! She is a wonderdog. This is a scupture and a video by Kate Kaman. It is a documentary. This is the installation of her sculpture here at Sherman Mills in East Falls. Each and every morning I experience the sculptures’ relationship with the architecture, sky, and light. It is a different experience each day; never the same and often breathtaking. Stopping voter suppression, by observing the vote. And sharing the results—on Election Day. 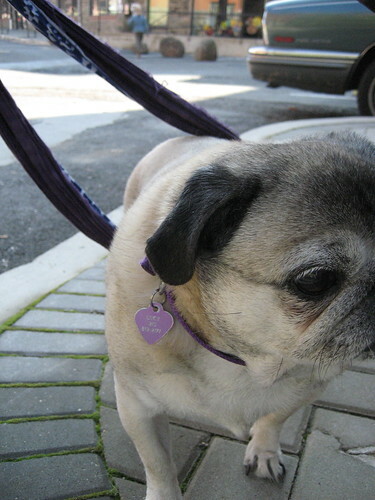 media and public to watch-dog the electoral process across our country. Here’s an example of what went on in one location in Maryland. Take a look at what happened around the country on election day. It is a very enlightening experience. 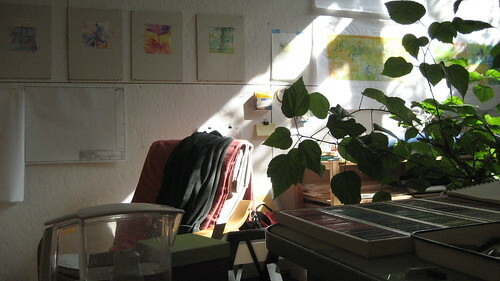 This is a photograph of my art studio. This is the wondeful light that I have starting in mid October. My hibiscus has begun to thrive and will bloom through the winter… in the summer they resie in the shade and a lush green without any blooms. October takes the leaves off the trees that block the light and it become an indoor spring. The natural light brings me to different kinds of drawings. I posted this image because it creates a sense of calm for me. On the wall are some of my drawings that I did over the summer months. I look forward to the winter weekends here. I’ll sit in my chair, drink tea, coffee, or chocolate depending on my mood. I’ll draw the landscapes of my memories. I’ve just started getting my drawings up online. You can check them out here. This is one of my favorite toys. He’s a poison dart frog. Dendrobates auratus, also known as the green and black poison dart frog is a brightly-coloured member of the order Anura native to Central America and north-western parts of South America and was introduced to Hawaii. I love his colors and his pattern. I have photographed him in lots of locations. It was a bit unsettling however when I came to my desk the other day to find him engaged in this balancing act. I wasn’t sure how he got that way but somehow his showing off seemed a plea to be photographed. 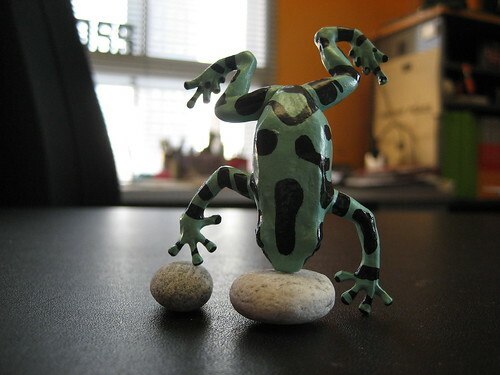 No, he isn’t glued or attached in any way… he’s balancing on these two pebbles. He stood on his head for 12 days. It was only when I banged into the desk with my messenger bag that he fell over. He’s moved over to another piece of furniture and he’s been there for two weeks. I think he’s going for a record. I found this at youtube. It is a perfect example of visualizing data; not only to inform but to inspire.